I see you decide to follow my style lol. great use of circles, even better than me in fact, great use of black and white and the wallpaper is full of impact. However, u may want to cut down the excessive use of them on the right side, which can be a little too busy as the left side is lesser busy. Great work. you get a fav from me. Love the black and white thing you've got going on and nice use of the vector brushes. Nice job! man, that's awesome i love the black and white effect. And the brushes match really cool. YOu got a fav from me. Nice work man. it really looks COOL! love it black! I agree with devildude that it feels a little unbalanced with all the circles only on the right side...maybe if you moved a few of them to the bottom left side? or made them farther apart? I'm a huge fan of Vash and I love this! This has a different look from all the rest of your walls. It looks incredibly awsome. The black and white looks cool. Nice usage of effects. Very smooth & soft bg, but I think you have to smooth-up the image too.. man, I thought it was vectored! But oh well, it still looks nice^^ The wall is awsome, great, cool, stylish, moody, enjyfull, & well done^^ Vash looks soo cool with his pose there! But I think it doesn't blend well with the smooth bg, & remove the bevel & emboss effect if you did. Try to add an outer glow & inner glow effect & see the results! ;D & nice smudging with the botton ;) The bg is very smooth & clean, looks like it was vectored^^ Great job! I'll definately add this to my favs! Keep up the great work! Hi uchiha-vegeta. 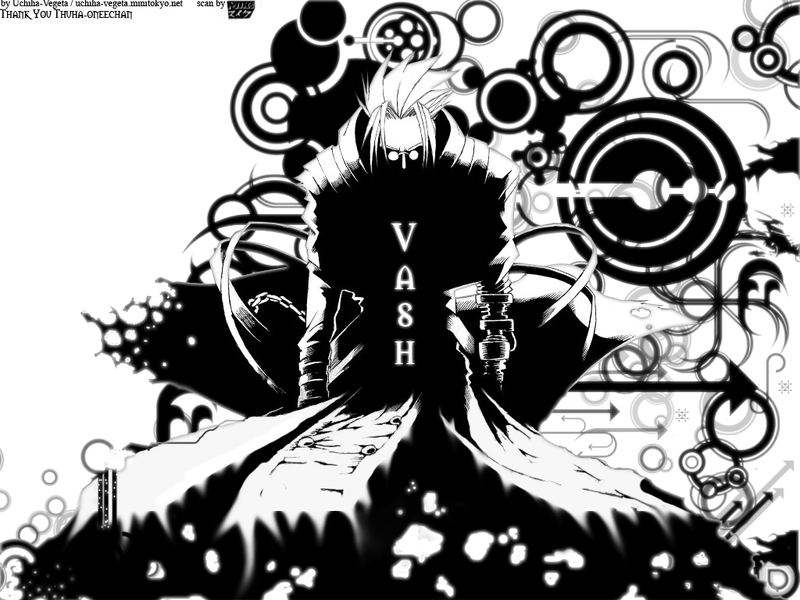 This is an awesome Vash wallpaper. I love the black and white theme, seems to work with the scan of Vash. The thing that, slightly drives me crazy is the circles on the right side. There seems to be too many for my liking, but still they're a nice effect. Very nice work; a fave from me my friend. omg! that's fuc*** amazing i loveee it. ^_______^ so damn cool. a fav for me yay!